In today’s world of high speed automobile travel it is hard to imagine how important mountain passes were to to the pioneers who crossed the Rocky Mountains during the westward migration of the 19th century. In southwestern Wyoming, US Route 89 crosses between the Gannett Hills and the Salt River Range through Salt River Pass. This pass was on the Lander Cut Off, an alternative road from the Emigrant Trail (the collective name for the Oregon, California and Mormon Trails). I can imagine the wagon trains stopping at Salt River Pass to gaze down into Star Valley just as we can today. They would have then proceeded down to where the town of Afton stands today and turned west toward Oregon and California. The Lander Cut Off, which was the first government road project in the west, opened in 1859 and remained in use until 1912, when automobiles made it obsolete. Salt River Pass is also a divide in the watershed. From this point water flows north to the Snake River and thence to the Pacific Ocean or south to the Bear River and into the Great Salt Lake. There is a parking area at the top of Salt River Pass at an elevation of 7630 feet. It is one of the most scenic view points between Salt Lake City and Jackson and well-worth a few minutes to contemplate the beauty of the Rocky Mountains and to remember the pioneers who crossed here. 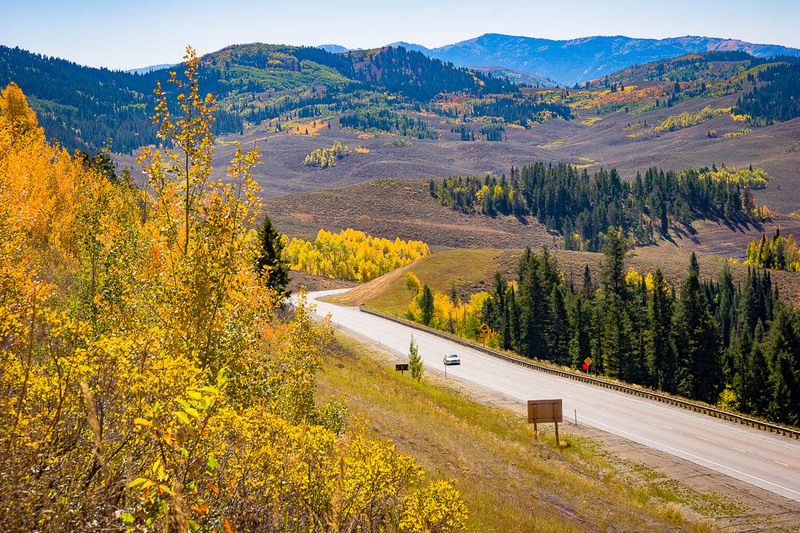 To learn more about the driving to Salt River Pass, go to the Montpelier to Jackson Road Trip Guide. I pulled over at this beautiful location en route from Yellowstone NP to Bryce Canyon in autumn 2016. I contacted Jim today to help me identify the location as I had no idea where it was when I returned home to London, UK. He got back to me within the hour to let me know. Very impressive service to Route 89ers. Thanks Jim. Print Edition 32-page magazine to take along on your trip. Click below to order from Magcloud—$15 plus shipping. E-book designed for planning your road trip with link to 170 websites for places to visit along US 89. Download immediately for $5 by clicking on the Buy Now button. Download the table of contents and a sample page for free. Learn where and how to photograph the scenic beauty of the American West with this e-book by James Cowlin. Border to Border on US Route 89: A Photographer’s Guide to America’s Most Scenic Highway is ready for you to download for just $7. To secure your copy, simply click the Buy Now button below. You’ll be taken to a page where you can make your payment via PayPal or credit card and get immediate access for download. US Route 89 2019 calendar celebrates the diverse landscapes of the national parks, monuments, recreation and wilderness areas along the highway. Preview the calendar and purchase for $12 plus shipping by clicking the link below. US Route 89 Road Trip Map Book is your complete guide for planning your next vacation. Available as a printed book and a downloadable e-book. Go to the Road Trip Map Book page to order yours today. Learn all the benefits of Membership and the many ways you can support the US Route 89 project. Check out the US Route 89 Shop to purchase some cool stuff. The giant saguaro cactus is the universal symbol of the American west and are found in a relatively small area in the Sonoran Desert of Arizona. The park is divided in to two districts to the east and west of Tucson. Drive though the park at sunset to experience the beauty of the towering saguaros silhouetted against mountains rising above broad valleys. 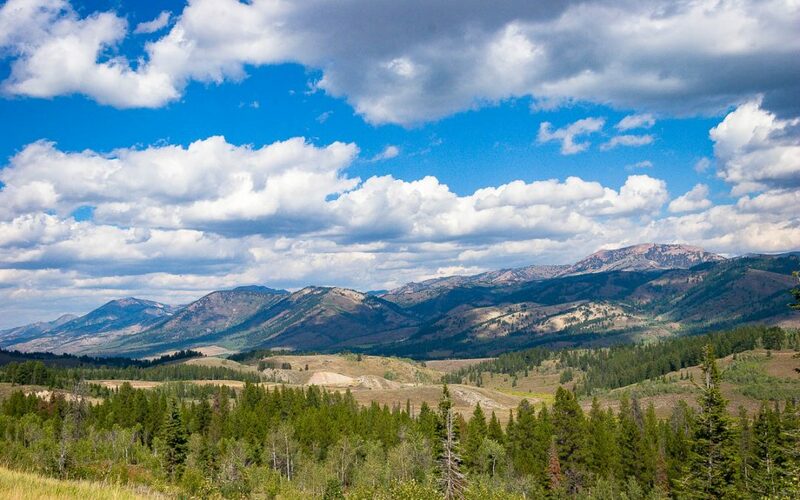 The Teton Range rises nearly a mile above Jackson Hole, Wyoming, the valley below the eastern face of the mountains. A dozen of its peaks are over 12,000 in elevation and with no foothills to obscure the view they can be seen reflected in the large lakes at their base. There is no more spectacular and iconic view any where in the Rockies. Grand Canyon National Park is really two parks in one. The North Rim which is nearly a thousand feet higher than the South Rim is only accessible in summer. Standing ten miles north of the Colorado River, the view from the rim is of long side canyons and the towering buttes they have carved. The South Rim stands a mile above the Colorado with vertigo-inducing views of the colorful rock layers that record a billion years of the Earth’s geological history. Glacier National Park in Montana was established in 1910. In 1932 it was linked to Canada’s Waterton Lakes National Park to form the world’s first International Peace Park. The parks are renowned for their glacier-carved mountains and deep lakes. Here at the narrowest point in the Rocky Mountains, ecosystems from the Pacific Northwest, the northern forests and the Great Plains converge to form a unique community of plants and animals found no where else in North America. Despite the name, Utah’s Bryce Canyon is not a canyon but an amphitheater created by erosion on the eastern edge of a high plateau. The erosion of the soft rock has left a spectacular array of red, orange and white hoodoos below the rim of the plateau. Carved by the North Fork of the Virgin River, Zion Canyon in Utah is fifteen miles long and up to a half mile deep. The bottom of the canyon is filled with stream-side vegetation and many hiking trails lead into side canyons with hanging gardens and waterfalls. Yellowstone in Wyoming is America’s first national park and nowhere in the world is there a larger concentration of geothermal features. In addition to the geysers, hot springs, mud pots and fumaroles, the park abounds with wildlife including moose, elks, bison, bears and wolfs.